Students’ success at work, in school, and in society is often determined by several factors including skills, knowledge, and ability to interact with others. But there is one thing that will accelerate your success in life: having a mentor. A mentor is an experienced person who can guide, train, and give advice to those who are new to the game. A mentor has previously acquired knowledge, experience, and skill in the journey upon which you are getting ready to embark. In short, a mentor is willing to hold your hand and guide you as far as you want to go. Well, the Mentr app does exactly that. Founded in San Francisco in January 2016 by Nishant Asthana, a serial entrepreneur, and Abhinav Anand, a veteran product manager, Mentr exists to make quality advice about college admissions and career preparation accessible to every single student regardless of financial or social status. 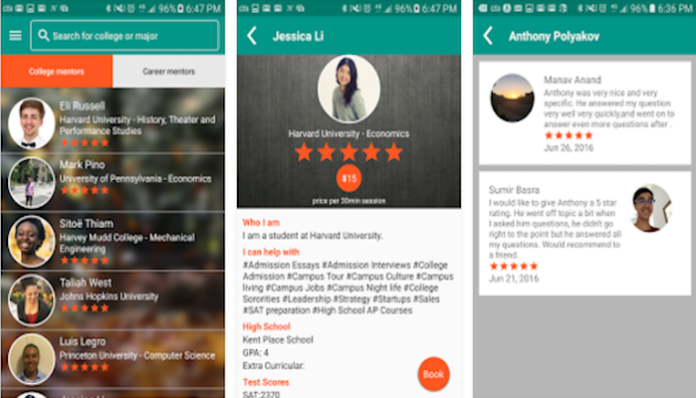 With that mission in mind, Mentr is the must-have mobile app that helps provide college preparation and admissions advice to high school students and their parents. Mentr tries to make sure that every high schooler will find unbiased advice from fellow students, graduates, and experienced individuals who have walked a similar path. Each mentor on the app is sufficiently vetted and possesses relevant knowledge and experience that they’re willing to share. Students gain a partner to help them chart their own academic and career paths and parents feel comfortable that their child is getting the information and advice they need to succeed. Finding a mentor can be difficult and expensive. With the Mentr app, it doesn’t have to be. Want to know if Mentr works? It does. With 1-on-1 and group college preparation advice by college mentors, college campus tours hosted by mentors, live virtual college tours by college mentors, application essay reviews by college mentors, college education seminars for parents, free resources, guides, financial planning calculators – Mentr is successfully helping students get into their dream schools. Mentr, which has both College & Career app versions available in the Appstore and Playstore, is quickly becoming the go-to app for all students’ college and career needs. Feature image via screengrab from Mentr.